First thing each morning, I feed my inside furry baby, Alexa (the stereotypical long-haired, chubby, spoiled-rotten cat who rules her domain) and provide her with fresh water (yes, from a bottle in the refrigerator). Then I turn my attention immediately to my outside children: Feral cats and “reformed ferals” who are now fat, spoiled housecats who happen to live outdoors. They’re fed and watered, while obscene amounts of attention and love are poured upon them. Those that allow it are held and told how precious they are while those who don’t allow me to even touch them are told the same words from a distance. This love fest is repeated throughout the day. I keep both eyes peeled for arrivals throughout the day and, naturally, greet them with treats and salutations. Oh, and photos… so many photos are taken! 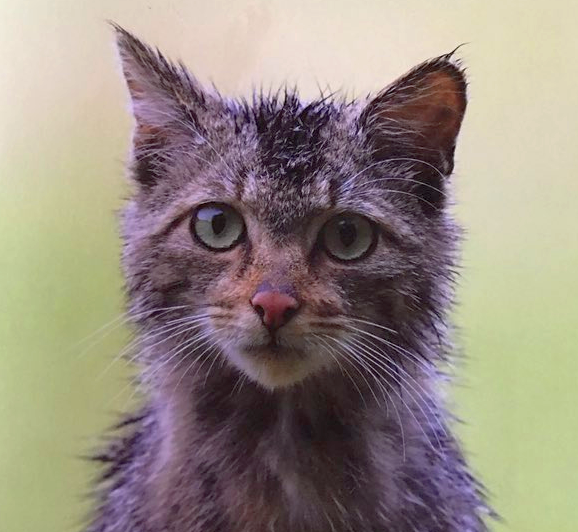 Call of the Cats: What I Learned about Life and Love from a Feral Colony has inspired me to write more about my own beloved feral cats (who are, at this point, simply known as family). I’ll be adding more pictures of these special little family members regularly to Cat-Pause, as well as stories from here on out and I have this incredibly beautiful and fun to read book to thank for the inspiration. When aspiring screenwriter Andrew Bloomfield moved into a bungalow in Southern California he soon discovered that he shared the property with a large colony of feral cats — untamed, uninterested in human touch, not purring pets in waiting. But after a midnight attack by predators that decimated yet another litter of kittens, Bloomfield decided to intervene. He began to name and nurse, feed and house, rescue and neuter. Drawing on his time living in Asia among spiritual teachers, he takes us on the contemplative, humorous, and poignant journey of saving these cats, only to find it was they who saved him by revealing a world of meaning beyond his unrealized Hollywood dreams. While Call of the Cats is an especially riveting and heart-touching book for those of us who care for (and love unconditionally) feral cats, the book is a must read for all cat lovers. Even if the only cats in your life are the ones now lying on your bed, you will be touched by, amused by, and affected by this beautiful book and the author, Andrew Bloomfield’s Texas-size heart. Andrew lived the better part of two years in Nepal where he followed a 17th century pilgrim’s guidebook to research spiritual sites around the lower Himalayas. He has worked as assistant manager and book buyer for East West Books in Manhattan, and for Snow Lion Publications in Ithaca, NY. He wrote Learning Practical Tibetan (with MP3s) for Snow Lion. In Seattle, he opened his own bookstore, Infinity Books, in Pioneer Square, where he hosted many public events, including appearances by renowned Tibetan lamas, Hindu saints, and Zen masters. He moved to Los Angeles and wrote How to Practice Vedic Astrology (with CD-ROM) for Harper Collins, subsequently published by Inner Traditions. 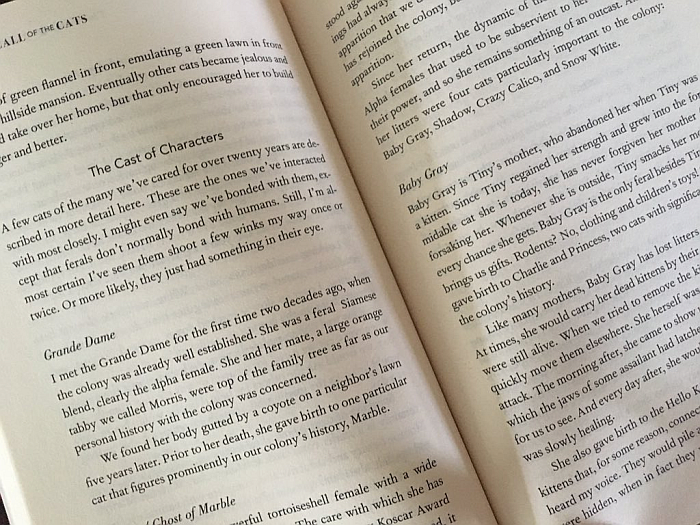 When writing book reviews on any of my websites – whether it’s a cookbook review on my food blog or an inspirational book review on my self help blog, I always like to tell why I loved the book, what my first and last reactions were, and (most importantly) what my readers will get from reading the book. I try to accomplish all of this without giving away anything within the book that I want future readers to discover for themselves. A book reviewer should, in my opinion, set the tone for the book without giving anything away. 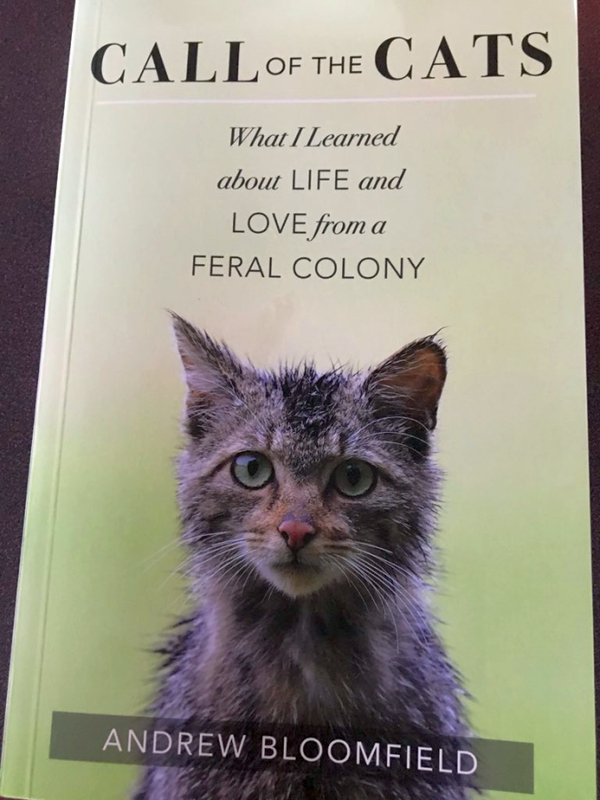 When I enjoy a book as much as I did Call of the Cats: What I Learned about Life and Love from a Feral Colony, it’s especially hard. My words get so worked up and excited that they trip all over themselves – like a litter of kittens all trying to get to “milk time” first. Why did you begin feeding these cats when you knew they would become dependent on you? Initially the impulse to feed the cats was in response to watching on of the cats die from choking on a bone it had scavenged from a neighbor’s trash. That was the impetus for making sure the cats were well nourished. Imbedded in that was the tacit understanding that we were making a commitment, to always be there for them. Or if not, to find someone to take our place – which is what happened. The thought of their dependence on us was a secondary consideration, and for us not as important as making sure they were getting safe, nourishing food. Dependence has somewhat of a negative connotation, and perhaps having wild cats depend on us was wrong. I have no way of knowing. But from our point of view it would only have been wrong if we were inconsistent with our care-giving. Why did you spend money on these cats when you could barely support yourself? None of this was very well thought out ahead of time! But I’ve come to learn that truly helping really has no self-reference. As I mentioned in the book, I once heard a spiritual teacher comment that the mantra of stupidity is “what about me?” It’s been my experience in life that whenever I’ve tried to self-protect or wonder “what’s in it for me,” I end up with less. What I tried to hold onto for myself slipped through my fingers like sand. Also, whether I fed the cats or myself with my last dollar didn’t much matter. Either way I was going to be broke. How do you know that Trap Neuter Release Really Works? In my case I can only share my experience from one colony of cats in my back yard. As a result of TNR we went from 50 cats to 6 over time. The colony naturally and organically grew smaller as older cats died off and weren’t replaced by others, as no other litters were possible. So in our case the results were textbook, just as described. Obviously most won’t be called to care for cats. Can you shed any insight into how others might find their life’s purpose? I do believe one key in discerning one’s true purpose is simply by doing the thing right in front of your face. The thing closest at hand. Our civilization is skewed toward unease. An unease born of not looking like, having, or accomplishing whatever an advertiser deems to be indispensable at the time – or what the idol-of-the-day embodies. Thus many strive to look like, or be like, or have the things we’re told will bring us satisfaction. But what is lost in that search is authenticity. Authenticity is being true to oneself – being comfortable in our bodies and content with our skill sets. I’ve met parking garage attendants who take great pride in their work and are more fulfilled in their lives as a result, than some Fortune 500 CEOs. Beautiful Cover Model of Call of the Cats! I believe he really nailed it when he used the word fulfillment. The happiness that comes from being fulfilled with what you are doing is unlike happiness that springs from any other source. 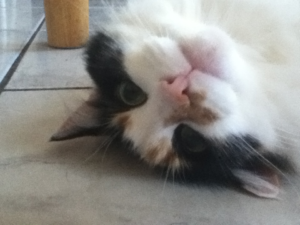 Caring for cats gives cat lovers a great sense of fulfillment. When the happiness that comes as a result meets the love that flows from cat to human – it’s simply a breathtakingly beautiful thing. I chose to end this article with the precious picture above – the one that graces the cover. I don’t think a more apt or perfect picture could have been chosen for this book because this is, quite frankly, the face of the feral cat. You can see pride in the eyes – because no animal is more proud than a cat! – but you can also see a need to be cared for. There’s a hint of vulnerability in every cat, whether she admits it or not. There are so many things (some with fur, some with not) that have the potential to harm cats and when we take it upon ourselves to help them dodge harm, we do a great, fulfilling, and even beautiful service. It’s the cat’s pride that is always at the front of my mind when caring for all of my cats (inside, outside, tame, wild, feral… they’re all family!). My family and I always seek ways to help the cats help themselves by providing food, water, and shelter. One of my sons-in-law builds “cabins” for them and my husband buys heating pads for the cold months to place inside the cabins. My youngest daughter and I find blankets, sleeping bags (so thick and comfortable! ), and even pillows to make their lives more comfortable. Caring for cats is an honor and one of the most rewarding things I’ve ever known. If you love cats, trust me, Call of the Cats is the next book you want to read. It’s inspiring, uplifting, heart-touching, and often downright hilarious. It’s a highly entertaining read and one I highly recommend. It would also make an EXCELLENT gift idea for the cat lovers in your life… a gift they won’t soon forget.